Our shopping bags have officially been launched in Finland. Thanks Teija and Sara for supporting our project so generously and patiently. The beginning of a great partnership. My last day in Nepal for 2018 ended on a very high note. 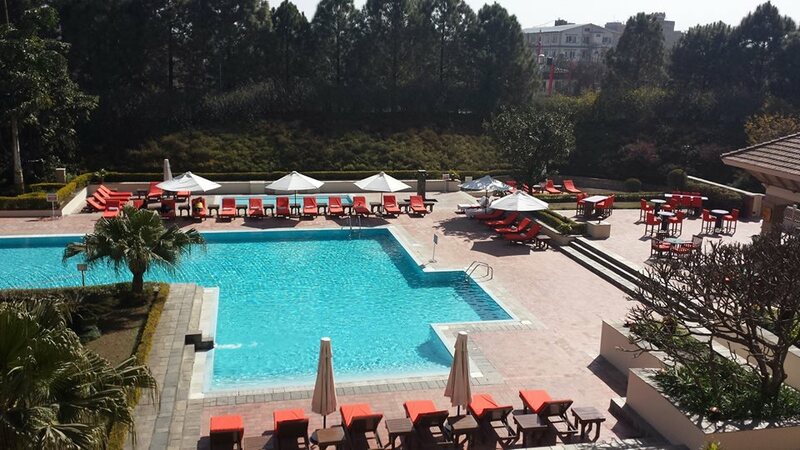 Kedar and I went to the Hyatt Hotel in Kathmandu. We are very grateful to them for giving us our first break, with an order for chef coats. They need more, and I wanted to see how the last ones fared ... after 2 years of constant use. Really, our goal is to export, so we need the best fabrics. I was very pleasantly surprised ... and shocked to see that our uniforms looked so good, and with very little pilling and staining. The Hyatt Laundry is very high tech, with US$100,000 washing machines and 3mt long machines that iron the sheets, so it was a very interesting place to visit. We met with Prakash, the laundry manager. He has a degree in textile engineering and was glowing about our fabric and sewing. So right now, I feel very lucky and elated ... as I ordered this chef coat fabric blind, from a few samples sent to us from China. We need to order more fabric, so it feels very good to have this much confidence in our fabric. Prakash also told us that if we had the capacity, they would order ALL their linen, curtains, soft furnishings, towels and uniforms from us. His reason for encouraging us to expand, was partly due to the quality of our product but also for the fact that we are a social enterprise .. and Hyatt is very happy to support our work. We really need seed funding, in order to be able shift gears to this level ... and to be able to export. This has been frustratingly elusive, as I can see the potential in this enterprise so clearly. I am really praying that the shopping bags will change all this. With each step, we get stronger. We now have all the paperwork completed for our application to become an INGO (International Non Government Organisation). This includes a recommendation letter from the Australian Embassy in Nepal. We have sorted out all our production issues with the shopping bags and are now in production mode ... and I am armed with beautiful samples. We even have a kind-hearted importer willing to give us paperwork!!! But most importantly, we have a 5 minute film clip ready for our crowdfunding campaign .. due start in January. I would have preferred to launch the campaign before Christmas but we simply ran out of time. I'm OK with this, as I have come to accept that things happen in their own good time and that it is meant to have gone this way. I am feeling very confident about the enterprise ... but happy also, to be home in Australia with my family. Always a bit of a culture shock ... but I can live with that. I also need a break. I received a couple of comments by Nepali's concerned about us not using handcrafted fabric for our shopping bags. I really get the concern ... because I too love the handicrafts of Nepal ... and some of it is endangered. Handicrafts are part of Nepal's intangible cultural heritage, just like the Gandharba music. I do however, think we can have the best of both worlds. Using the word 'mass produced', I know, has negative connotations, but in this case, I feel we are making the most of a fantastic innovation that is, in a small way, solving a worldwide environmental problem .. so I can't apologize for what we are doing. Our shopping bags are not intended to replace handicrafts. Rather it will give us the opportunity to spread the word about Nepal's amazing culture quickly and easily, whilst providing employment for many, many women ... AND, we fully intend to promote Nepal's handicrafts and sell them through our website. Today I met with Sarbagun Tamrakar and his beautiful wife. They have been making and teaching traditional block printing with Newari designs for 40 years now. Newari are the indigenous people of the Kathmandu Valley. They have an incredibly rich culture ... especially as far as their food goes. It was very exciting meeting Sarbagun and hearing about the traditional techniques which include using vegetable dyes. And we have decided to work together. David Brown we have a very interesting education story here. The first shipment of fabric has finally arrived. From the beginning, this project has been punctuated by big sighs of relief. One of the tricky things was ordering bias binding without seeing it first. Getting the colour, weight and shininess right and in a fabric that would be easy to sew ... was a real challenge. And it is perfect! We still haven't worked out how to import fabric without it costing an arm and a leg ... as the import companies here, don't appear to be willing to give us receipts, even though we have paid them for all the costs ... fabric, transport, import tax, VAT, Customs clearance fees and insurance. It took almost two months of exploring different options ... and in the end we gave up and decided to bear the cost. If we were to import the fabric ourselves, we need to get an AXIM code, but this means having to leave US$3,000 in our bank account permanently ... as a guarantee ... for what I have not yet been able to work out. In Australia this is so simple and takes a single phone call to organise ... and you get all the receipts as a matter of course. Any Nepali's reading this, who know how to solve this expensive problem, please contact us. Anyway ... happy that the fabric is so beautiful and that the bias binding is the perfect colour and thickness. We can finally begin production. A full house tonight, at Sarangi Veg. But the thing that made me so happy was talking to the guests, who told me how surprised they were to find a place like ours. They love the food ... the spirit behind our project ... and of course, the music. And everyone we show our shopping bags to, is bowled over. Kedar and I went to the Australian Embassy last week. We are taking the big step of applying to become a INGO and one of the bits of paperwork required is a letter of support from the Ambassador. After sharing for over an hour, we had his complete support. It is so satisfying when other people can see the vision we have worked so hard to create and fulfill. We have well and truly reached the tipping point. We are so happy. The kitchen staff are so talented. Thanks so much Nerika, Sabin and Alex. And the waiters really look after the guests. Thanks Sudesh and Nam Raj. And Kedar of course for your commitment. I am so proud of you all. And the musicians Amrit, Sanu, Subash, Pujan, Suesh. It makes me so happy to see you all playing together. Tejendra Gandharva was at our restaurant just now. The song he has composed here, is about Nirmala Pant, a 13 year old girl who was raped and murdered a few months ago. This has become a very high profile case, as there are many allegations of a police cover-up. There have also been many demonstrations, which highlight how much people are calling for a change in attitude to women in Nepal. The traditional role of the Gandharba was to travel from village to village spreading the news and in this song Tejendra is fulfilling his traditional role. From a starting point of thousands of contestants, he is now in the top 6 of "Voice of Nepal 2018". This has been the most played song in the show's history and you can see from the standing ovation how moved the audience was. All the best Tejendra for the future. The seemingly never ending road from Kathmandu to Janakpur … and a few images of village life in there. Since we have been there we have not seen one Western face. It is a unique experience that's for sure. Lots of interesting interviews with the artists and Ram Ashish Yadav yesterday. Ram Ashish is a local Janakpur politician and social activist who was instrumental in the transformation of Ganga Saga, a very holy pond for Hindu people in Janakpur. On special Hindu occasions like full moon, the local people would cleanse themselves in this lake, but it had become so polluted that this was no longer possible. As a result of the pond clean-up, Ram Ashish, who had been a prominent journalist, was requested by the local people to run for government. He was elected on this dire environmental issue in a landslide victory and now continues his work for a 'Clean Green Janakpur'. The government in Janakpur is now working hard at planting trees. They are also in the process of banning plastic bags and educating local people by introducing their own cloth shopping bags. Our shopping bags displaying the Mithila art have been so warmly greeted by everyone we meet. This has been so satisfying for me personally. The people of Janakpur are proud that our shopping bags will go out into the world and promote their unique culture. Things are steadily moving forward. We now partnering 'Warlukurlangu, Artists of Yuendumu'. Yuendumu is a very remote town 293km NW of Alice Springs in the Northern Territory of Australia. Michael Flatt introduced me to this organisation, as he worked in NT as a social worker for many years. We are so lucky to have Mike as the Secretary of our charity in Australia. Thanks Mike for being so supportive. Warlukurlangu have been operating since 1985 and are very professional. They really look after their artists well. We will be choosing three of their artworks for our shopping bags. Really ... what an huge honour ... and David Brown and I will be going there in the Autumn to film the artists at work. It is very hot there right now, so this exciting work must wait. I stop functioning in extreme heat. Nepal gets very hot as well, humid, but this is dry heat, like walking into an oven. Thanks so much Louis Reed for supporting this film work in Nepal and sharing it with your communities. We have solved the biggest technical challenge in sewing our shopping bags ... with a rs400 (AU$5.50) attachment on our sewing machine. This was my biggest worry. If you look closely you will see how perfect the stitching is ... and I am always looking very closely. Luckily we have a very dedicated and talented team who know how important it is to keep the machines running in perfect order. Thanks so much Suresh and Gayan. Only a few tricky steps to go before we go into production .... like sending the money to China to pay for the RPET fabric. This has been very difficult but I think we have solved that one as well. The reaction of people here, tourists and Nepalis alike has confirmed what I was quietly wishing for. Really WOW! I can't wait to go to Janakpur and Tikapur so that I can share the progress with our partners in person. It is Dassain now and I have the restaurant to myself, as we are closed. Ah! peace and quiet in Kathmandu. Who needs customers anyway! Thanks so much for all the birthday messages. It reminded that I am loved and not alone ... which sometimes I lose sight of. I've been in Australia since the beginning of April, which feels like forever, but I'm counting the sleeps now ... seven ... and then back to my second home, Nepal. I am at the same time super impatient and super patient, as I can see how far we have come in the last year. The big achievements since being back are; receiving DGR status from the ATO and becoming a fully fledged charity in Australia; completely redeveloping our website (see www.sarangi.com.np); applying for a grant from the Australian Government which was only possible through a culmination of partnership building over the last year. Thanks Kedar and Yogendra for that stressful work with the SWC. We will get there, so don't be disheartened. .... and finally, the product development work complete on our 'Say no to plastic bags' project. Thanks Mike Trueman for planting this seed. After many trials, the first shipment of fabric has now been ordered from China. We are making lightweight shopping bags out of RPET pongee, a polyester that is made from recycled plastic bottles. It looks and feels like regular fabric and is printed with the most beautiful Mithila artwork, created by Nirmala and Raj Kumari, women artists working at Relative Nepal in Jankapur. Thanks so much Jay, for trusting us and being so patient throughout this long process. I am also really looking forward to working with you Matrika and your social enterprise in Tikapur. Mahalaxmi Garment factory employ women freed from the Kamaiya and Kamlari (bonded labour / slavery) systems and produce shopping bags for the local market. They are perfect partners for us. Working with you will give me an opportunity to see parts of Nepal that are new to me, which is very exciting. And of course a huge thanks to Merina and Prasanna at Chaudhary Foundation for making that important partnership possible. I also can't wait to see how far the women at Shakti Samuha have come with their sewing training. Shakti Samuha are the first organisation in the world, to be set up and run by survivors of trafficking and after these girls have completed their training, they will be offered work in our enterprise. The next step is to create a crowdfunding campaign with David Brown. That's the fun bit of this job. These shopping bags are destined for the international market including Australia and Finland. Thanks Teija for your work in this. And ... I fully expect all our Facebook friends to share this crowdfunding campaign like mad as I truly believe we have something extraordinary to offer the world ... and after all this hard work !?!? ... and by the way, we are also making a range of baby products. Here is my adorable granddaughter Misty, wearing our first RPT bib. She is our designated 'face of Sarangi baby wear'. And my beautiful daughter Bridie ... thanks for the car! Biggest thanks of all go to my sister Caroline who lets me stay with her in her warm and comfortable house. I will miss taking George (dog) for our daily walks and being able to visit Mama who has dementia and is in a local nursing home now. The first thing she says when she sees us is "I am SO glad to see you" and she really means it. It is such a blessing that this is what is left for her ... gratitude. Anyway, thanks for all the loving birthday messages. It makes this big job much, much easier and because there is so much more to do. Our friend and partner Matrika sent me this wonderful clip. It is a cultural song from far Western Nepal called Deuda. I am going back to Nepal on the 28th September and this time I will spend a lot of time out of Kathmandu working on a project that we have been planning for the last six months. Yesterday, I submitted my first grant application. It was a gruelling process but I learnt a lot about what is expected from DFAT (Department of Foreign Affairs and Trade). Poor old Kedar was on the front line, trying to get the Social Welfare Council of Nepal to give us a non-objection letter so that our new Australian charity will be allowed to work in Nepal with our Nepali sister organisation. Many, many hoops to jump through and with goal posts that kept shifting, we were both nervous wrecks by the end ..... and we did not get the letter in time for the 2pm deadline. I thought 'what the heck!' and submitted the application anyway, with a note explaining that we would get it to them on Thursday. I hit the submit button with literally only 2 minutes to spare. Calling it nerve-wracking experience is a real understatement. Let's see if the Australian Government is as a little more flexible than the Nepali government.In any case, it was a very interesting experience and collecting all the paperwork and answering all the questions gave me an opportunity to really develop our plan of action. My concern is that we are such a young charity in Australia that they will look at our audited accounts which are very, very slim .... and then not even read the rest. If they are judging on creativity and passion we will pass with flying colours. If they are judging on how safe their money is, based on our Australian bank account, then we will fail miserably. Anyway, thanks Matrika. Watching this clip makes me realise what a wonderfully rich country Nepal is ... and that woman is so strong!! Very inspiring. As I am working on updating our website, I am looking back at old photos of the restaurant. It's a pity I could not include the smells and the cockroaches in the before photos ... for greater impact! For people who like 'before' and 'after' photos. OK bragging now ... we now have 200 five star reviews on TripAdvisor. That's 86% of all our reviews. We are truly proud to receive a Certificate of Excellence again this year from Tripadvisor and grateful to all our guests who took the time to support us with their wonderful reviews. On behalf of the staff at Sarangi Veg thank you. “One of my favourite video stills from filming in Nepal last year, a random moment on the street. This was taken near some ancient temples that were partially destroyed in the earthquake yesterday in Kathmandu. We have no way of knowing whether this girl survived. When faced with world events we often feel powerless, there is nothing we can do. That feeling also means that we care, whether we acknowledge it or not humanity fuses us all together, we feel discomfort if we know something is happening in some part of the world where people are suffering. We do all care, we just need a means of taking action. What can we do for events such as this? The very best news!!! We have been approved by the ACNC (Australian Charities and Not for Profit Commission) for DGR (Deductible Gift Recipient) status ... on the FIRST round. In the background though, was five months of partnership building and committed strategic planning ... which I am becoming expert at. Of course this swift acceptance was mostly due to the caliber of our partners.Merina Ranjit Nepali and the NSB team, Mahalamaxi Jhola Udhyog, Relative Nepal, Shakti Samuha, Together for Nepal, Solidarity and Swiss SolCom. And of course for Kedar Gandhari and the team at Sarangi. Thank you all for your commitment to others. I am so excited about working with you all. Being accepted for DGR opens so many doors for us. We now have a much better chance of getting corporate sponsorship / investment. We are committed to a social enterprise model so it is investors that we are really after, not donations. We are very proud of that. DGR will also assist us in creating powerful partnership with Australian organisations ... and we have a couple in the pipeline. Thank you, thank you, thank you Olivia at the ACNC. I have been watching an excellent seven part series on Netflix about the Roosevelts and last night had a nightmare that I was nominated to take the minutes at a congressional hearing. In the dream, was completely out of my depth and woke up convinced that in order for our charity to succeed, I would need to go to university to complete a diploma in international development ... and only then would I be taken seriously. These diplomas cost over AU$17,000, so are completely out of the question for me. After this huge breakthrough I am convinced that anything is possible, if you truly have your heart in the right place and are prepared to work very hard and not give up. I highly recommend 'The Roosevelts An intimate History. It is so, so inspiring. I am a creature of habit and every morning I like to read the newspaper with my coffee ... but I'm too stingy to buy a decent paper so I end up reading the Sun Herald. It is a terrible newspaper ... conservative, narrow minded and biased, but it does give me a glimpse into mainstream thinking which can be useful if you are planning to launch a product here. I imagine that sounds very judgmental. Perhaps I am still suffering culture shock??? "It's good for us and good for the planet and the message is increasingly hard to ignore: eating less meat is a win for us all. And according to the latest figures, from taste.com.au, it seems we're listening, as vegetarian and vegan cooking is on the rise - in a big way." Perhaps there is hope for Australians after all? We are feeling famous. The Himalayan Times, a major daily newspaper, came to our restaurant recently as they were doing a piece on Vegan food. We were thrilled to the first of 3 restaurants featured in their Travel and Lifestyle page. As my good friend David Brown says, we are rapidly becoming a 4 year overnight success. Signing the tripartite MOU with Nepal Social Business (NSB), Mahalaxmi Jhola Udhyog and Sarangi Social Enterprises was certainly a milestone for us all. Mahalaxmi Jhola Udhyog is a social enterprise located in Tikapur, in far Western Nepal. They are committed to reducing the use of plastic bags and to providing employment to communities freed from the Kamaiya and Kamlari (bonded labour) systems, which were abolished in 2000 and 2006. These practices were essentially forms of slavery, the impact of which, cannot be eradicated in one generation. Creating dignified employment is a start, and allows parents to send their children to school, ending the cycle of poverty and dependence. Creating employment opportunities in remote areas of Nepal is very important, as the social and economic consequences of so many young people leaving Nepal looking for employment is devastating communities. Partnering in this way brings all our strengths and resources together in a powerful way so it is a real honor to be involved. NSB provided the startup capital for the Mahalaxmi Jhola Udhyog social enterprise and is providing business planning support and valuable contacts, while Sarangi Social Enterprises is providing marketing assistance. Thanks so much Merina Ranjit Nepali and the NSB team, for creating this big opportunity. I am already missing Sarangi and the team so much. Back in Australia for the next phase of this incredible journey. This season has seen a real turning point for the project in general. The restaurant has always been a success as far as developing partnerships goes, but finally we are now truly viable as a restaurant business. Next step in the off season is to expand the kitchen, upgrade the equipment and renovate the toilets. We have been living on a shoestring for so long ... which is great as far as having to be creative with our limited resources goes ... but having more freedom around money will be a refreshing break. The biggest breakthrough however came only the day before I left, with formalising a partnership with Nepal Social Business / Chaudhary Foundation. This is is such an exciting partnership as they are the philanthropic arm of biggest private company in Nepal. With our other newly formed partnership with Shakti Samuha, a major trafficking rehabilitation organisation who won the Raman Magsaysay Award (Asian equivalent of the Nobel Peace Prize) in 2013, we are in a position now to do some very powerful work. I am confronted over breakfast reading an article in the Himalayan Times on the increase in burns and acid attacks on women in Nepal ... now estimated at 55,902 burns per year and 249 acid attacks between 2010 and 2017. And then I walk around the corner to see an endless queue of young Nepali men collecting forms for a recently announced opportunity through 'South Korea's Employment Permit System EPS'. Another big chunk of young Nepalis not seeing the opportunities here in Nepal and fleeing ... draining Nepal of it's most important resource. A sad and frustrating way to start the day. I am not even sure why I am posting this. Please ... someone give me some good news. I am sharing this from Miranda AndDan Hawthorn 's post knowing that it got a fair share of cynical comments. This is obviously not going to happen overnight. All human beings are not going to suddenly take responsibility for the impact of their individual food choices. It is way too inconvenient to admit they are part of the problem and most people feel powerless at being able to make a difference in general ... so they simply give up and do nothing. The point of the post is to make people aware of the impact of eating so much meat on a global scale. As people become educated, increasing numbers are turning towards vegetarianism and veganism. Thank God ... for the sake of the planet. Sarangi Veg is #4 out of 732 restaurants in Kathmandu. The reviews say it all. To be in this position at the beginning of the tourist season is really, really good for us. We have even made progress enrolling the other businesses in the courtyard to transform the entrance .... 'together' ..... an ongoing frustration to me over the last three years. Keep tuned in. We have some really exciting things in the pipeline. Feeling happy and excited. Tasty Soy Bites and Vegan Cheese Cake’ at Sarangi Veg. The perfect protein supplement for Vegans. The bites are made from organic soy beans and processed at a local Buddhist monastery. Such a lovely group of people we are honored to support. As if the universe was listening .... for the first time in the four years I have been in Thamel, I saw Gandharba busking in the street. These guys are from Jhapa in Eastern Nepal. It was so great to see them being appreciated after I had been bemoaning Gandharbas not being allowed to busk on the street only a few days ago. They will be playing at Sarangi Veg this Friday night. I will be in Janakpur so I am a little disappointed I won't be here to enjoy this special night. Big invite to all our friends. Today I did something unusual. Sometimes I see foreigners in the streets of Thamel playing music, with a hat or guitar case full of money in clear view. Usually there is a big crowd of people watching and listening. While it is a very common and acceptable sight in Western countries, in Thamel it is illegal. ie illegal for local musicians. The police turn a blind eye for foreigners. Unable to busk, the Gandharba and flute players approach tourists offering their instruments for sale. This is how they earn a living from their music. Unfortunately, with so many local shopkeepers and street sellers eeking out an existence by 'actively' touting their wares, tourists often feel harassed, and treat the musicians like beggars ... although all they need to do is politely say "no thanks" rather than getting all upset about it. Anyway ... I normally walk past these musician tourists, feeling annoyed. Today however, I decided to stop and I asked them 'politely' if they realised that the local musicians are not allowed to busk. Boy did they get defensive, mainly claiming that all they were doing was 'spreading the love' through their music and that I should learn a lesson from them. By then a large crowd of people had assembled, consisting mainly of local people, which felt uncomfortable, as I usually shy away from confrontation. In the end, after not being able to get a word in, I left them with a request that they consider including local people. When I shared this experience with one of my well educated Nepali friends, he suggested that instead of feeling annoyed, I should encourage my Gandharba friends to take a stand and bring this unfair 'law' before the courts. This was inspiring to me until I shared it with three Gandharbas who assured me that it would be a pointless exercise. It was disappointing to hear this kind of resignation. Where do I go from here? A very welcome discovery. Celery is the perfect plant for aquaponic gardens. Nepali celery is so full of flavor and without any hint of bitterness so is perfect for smoothies. Celery, orange carrot. YUM! Who needs unhealthy drinks when you have organic plants growing on the premises. Thanks Shankar Pantha for tending our garden so lovingly. HAPPY HOLI. With my Rotary friends. I love that they are so passionate about its principles. I didn't realise that peace and friendship are the foundations behind Rotary. Meeting with the Mithila artists in Janakpur was a truly humbling experience. They are so talented. And if I hadn't been stranded by a bus strike (banda), I would not have spent a whole extra day painting with them ... slowing down enough to realise that they are keeping their culture alive in the stories their paintings tell. We are working on an project that requires artwork, and it is very exciting that they are so open to collaboration and partnership. The extra day also gave me a chance to visit magnificent Janaki Temple. Janakpur is close to the Indian border so it feels, smells and looks less like Nepal and more like India. Samjhana Singh, one of the young artists was my delightful guide. I am really looking forward to returning in a few weeks to move things along. We are organising training for some of the women at Shakti Samuha, another amazing group of women who are transforming lives. I spent the bus trip back to Kathmandu feeling deeply happy and blessed that I get to experience my life in this way. I am coming back to Australia in early April. Please message me if you want more information about ordering a painting. As they are direct from the artists, the prices are very reasonable. "A charity that advances social or public welfare". This makes creating partnerships much easier, which will move our work along much faster. Next step is to register as a PBI (Public Benevolent Institution) with DGR (Deductible Gift Recipient) status. I am so proud that I managed to do this without assistance from a lawyer or specialist .... not that I didn't try to find one. In the end it was easier (and much cheaper) to just do the research and the work. I learnt so much along the way. Tomorrow Kedar Gandhari and I are going to Janakpur to visit micro-enterprise Mithila artists. Traditionally, the women in Janakpur paint the walls of their houses in this kind art. Being a 'women's only' art form makes it very interesting. We are working with this group on a project that will help us launch our uniforms in Australia. In my previous business Kids Art Works, I spent 14 years writing lesson plans for art teachers, so this is exciting for me personally. We will even get a chance to paint with the women. Two women from Shakti Sumuha (an organisation that rehabilitates trafficked women) are coming with us. They are such a great organisation. It is a real honor to have them join us. I am soooo looking forward to getting out of Kathmandu for four days and seeing a part of Nepal that is new to me ... and celebrating another milestone. A delightful afternoon researching looms. This small weaving factory in outer Kathmandu is a family business going back many generations. The very old lady in the photo with her daughter is a sprightly 92. They weave the most luxurious fabrics and scarves made from silk, banana and bamboo. We are partnering Together for Nepal, Italian NGO which provides weaving training for women effected by the earthquake. My favorite meal this week at Sarangi Veg. Homemade tomato soup with garlic bread. Thanks Nerika Guragaii You are the best. What inspired me to write this, was a post about chicken farming. Thanks Cynthia Shannon. It is important to me to make a stand about this. We have a vegetarian restaurant in Thamel and from time to time I watch documentaries about the ghastly impact to the environment and world health, made through meat consumption. If I remember correctly the statistics are that there are 58bil chickens in the world at any one time .... to feed 6bil people (and the cow, sheep and pig statistics are shockingly high as well). The world is NOT facing a human population problem, it is facing a animal (feeding humans) population problem. And it is not a humans taking too many antibiotics problem but a animals (feeding humans) taking too many antibiotics problem. Meat tastes great .... there is no doubt about it. But I really think we need to consider the cost. 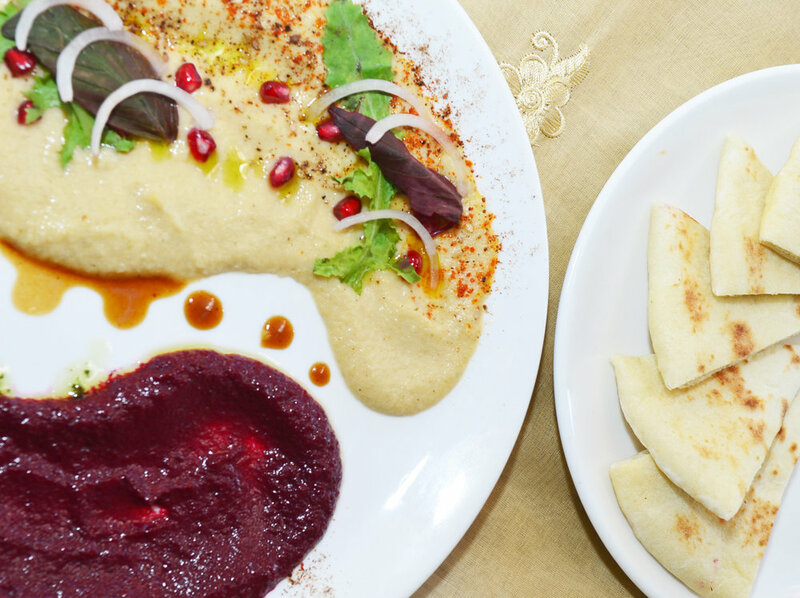 At our restaurant we serve absolutely delicious food. Nepal has the tastiest vegetables. Part of the problem I think, is that the food growers in Australia grow for 'good looking' food, but often it has no taste. At Sarangi, we make the best tomato soup I have ever tasted. The strawberries here are divine and the tomatoes, carrots and potatoes are the best I have ever eaten. I don't like preaching particularly, but as a species I think we need to take responsibility for the impact of our food choices. Admiring our handiwork at the Hyatt Hotel in Kathmandu today. The orange mattress and chair covers were sewn by Sarangi Social Enterprises, now a registered 'profit not distributing' company. It was so quiet and peaceful in the beautifully manicured grounds, that it was very hard to for me to leave .... a world away from the chaos on the street. I am however getting really good at crossing the roads. In Australia, pedestrians are treated almost with fear by drivers. It couldn't be more different in Nepal. While there are pedestrian crossings everywhere, they give you absolutely no protection. The best strategy is to wait until at least two other people are ready to cross, whilst placing yourself (a little selfishly) on the side away from the oncoming traffic ... and then to support the bravest person in the group in taking the lead, when they see a small gap in the traffic. Being a tall foreigner gives us added strength, so I always feel like an asset to the group. Some of the more nervous pedestrians will cling onto each other, which is considered perfectly fine in a country where physical contact is normally taboo. There is a definite sense of satisfaction when you reach the other side in one piece. It is actually a very effective system as the traffic barely comes to a standstill. Happy Birthday Nerika Guragai. You are our most talented and committed chef and I appreciate you so much. Have a wonderful birthday. Looking fabulous as ever. Yesterday Shankar Pantha and I attended a 'tree grafting' workshop at Charlie's organic farm in Panauti. I am not exaggerating when I say that it blew my mind. The Nepali teacher was a true 'master' and effectively turned jungle peach trees, which produce terrible tasting fruit, but have very hardy roots, into almond trees. It reminded me of a magic show and I couldn't help applauding at the end. The entire audience joined me, so they must have appreciated the genius as well. This man is such a great role model for local farmers ... and students from a local government school. What impressed me most was how interested the girls were ... particularly the girl in the red scarf who took notes throughout, asked several questions (very unusual for Nepali's, especially girls, let alone girls from a government school where critical thinking and inquiry are almost non-existent). At one point she burst into applause. It was very moving to watch. I applaud you Charlie. I am behind you all the way. If any of my Facebook friends have reached this part of the post and are interested in organic farming as a development tool please get in touch with Charlie Pat Kauba. Eating traditional food from the Chaudhari and Tharu communities in Southern Nepal - Ghongi (snail), sutuwa (shellfish) and gangata (Crab). Crazy food ... especially the snails. I have to say that I didn't get the appeal ... as they looked (and tasted) like they were cooked in mud. Being the only foreigner in sight among what looked like a million Nepalis certainly was an entertaining experience. The puzzling thing was that ALL of the hundred plus stalls were selling it ...and people were eating it???? But it sure was a fun experience. I couldn't resist posting this ingredient list from a Nepali porridge packet. For those who are obsessed with knowing exactly what they are eating .... and by when. And the name - 'Ocean' Dry Food ?? Happy New Year to everyone. I normally spend it quietly but this was at a whole different level of quiet. I offered to babysit 3 dogs for my friends Charlie and Larissa. Ballu, Coffee and Lucy are three very well trained and very sweet dogs. It was so so beautiful that I have decided to babysit every 2 weeks. The only trouble is that the bus ride can vary from a very pleasant yet bouncy 2 hour ride to a 3 hour hell in a sardine-can-local-bus ... depending on the conductor. The trip out there this time was maddening, as the conductor insisted on stopping at every stop harassing potential customers to alight an impossibly full bus. TIP - If you have long legs, don't sit in the front seat if there is a bench behind the driver ... as you will be jammed in. Certainly no experience for people who suffer from claustrophobia. Christmas with my Sri Lankan family. A very happy day. And super delicious food. A week or so ago, I was sharing with a friend that we needed photos of our new sewing machines for our website. Having overheard me (perhaps talking a little too loudly?? ), one of our restaurant guests approached me offering her services. Chloé Sinanoglu is a French photographer who spends most of her time travelling the world. Of course I jumped at the opportunity. The day she took these amazing photos was magical. We are partnering Sahara local NGO and SwissSolCom a Swiss NGO who recently gave us a social business loan to buy a three state of the art, industrial sewing machines (the white ones in the photos). The motor on these machines goes into sleep mode when not being used and therefore uses very little power. One of them is a 5 thread overlocker that sews, cuts and overlocks at the same time. I can get very excited about this kind of technology .... as it makes it possible for us to produce international quality chef wear. This partnership is perfect for us, as we can share the space and our social enterprise can employ the women after they complete their sewing course. It is a lovely building in outer Kathmandu ... almost rural, with an outlook of the hills ... and probably even the mountains when the air is clear during the rainy season. We have two big Kathmandu clients now, Hyatt Hotel and Annapurna Hotel. It is a very good start ... but our real sights are set on the Australian market. The women in these photos are half way through a sewing course run by Suresh our tailor and funded by SwissSolCom. They come from Nepal, Pakistan, Burma and Sri Lanka and are mostly refugees. The photos at the end are of the floor above ... four big rooms which will house about 25 more machines. The rent is US$150 per month ... steal. Getting there! This is the kind of rewarding work that has me jump out of bed in the morning. Test driving our new bean bag design through an imminent monsoonal downpour....which has been unseasonably early this year. I don't mind the rain at all. I love the way it cools everything down. The only problem right now is a blocked drain flooding the street outside our hotel. This is the main street of Thamel which has always had drainage problems. The stench is disgusting. Apparently, the company responsible for installing the new drainage pipes ... that everyone has been looking forward to so much, has absconded with the money and there is no-one with the relevant skills to finish the job....and this is at the beginning of the monsoon! Anyway .... this is a very clever bean bag design with only 5 pieces. We have our first big corporate order - 10 bean bags and hundreds of kitchen and spa garments for one of the biggest hotels in Kathmandu. These bean bags will adorn their pool area so I am working hard to get it right. My mothers sewing machine came in handy again. It took a couple of days to get the prototype perfect. Most importantly, it is filled with recycled polystyrene. I am sure the slight fishy smell will dissipate with time!! (truly not that bad). At US$2 per bean bag as opposed to a quote of US$45 for environmentally very unfriendly new polystyrene, there was no other choice. It is actually a lot more comfortable ... so bonus there. Our baby organic stevia plants arrived today. Creating our aquaponic garden has taken us down many interesting paths and stevia is by far the most exciting one. We are aiming to become completely sugar free at the restaurant by the end of the year. The sweetness of about three stevia leaves can replace the sweetness of sugar in a can of 25% sugar-reduced carbonated soft drink (330mL). Consumed in its organic form as fresh green leaves or in simple dry powder form ... as opposed to the highly refined granulated form that we see in Australian supermarkets ...has huge health benefits. Studies indicate that stevia reduces blood pressure and encourages insulin production. It also has anti inflammatory properties and reduces plaque on teeth. Diabetes is a big problem worldwide and especially here in Nepal as are dental problems, so we are committed that this project makes a difference. This season, Spring to Autumn we will be working with a local family who lost their father and home in the earthquake. This family have a beautiful well tended garden and I know they will nurture these babies with great care. We will also be working with a 'barefoot' permaculture group. They train Nepali farmers to go into villages and train other farmers in permaculture techniques . The success rate of farmers teaching farmers, as opposed to 'experts' teaching farmers is much higher. Farmers trust other farmers as they can relate to them. Also, Kathmandu University have conducted in depth trials both in the field and laboratory. They are very generously assisting us by giving advice and access to all their results ...and they can certify us a 100% organic. They will also provide us with cultures ie they take the best mother plants and replicate them in volume. This will save us a lot of time and energy, as we plan to take our seedlings into the villages next season.. The health implications for the villagers will be significant and they will also benefit economically as we will buy their excess. The last two days have been crazy, in a way that only happens for me in Nepal. I get this occasional job finding 'extras' for UK TV shows?!?! This time I was given 36 hours to find 20 people who could pass as British solders. The search was a day and a half roller coaster of finding and then losing people and ever shifting goal posts ...as the brief changed. A logistical challenge is a kind description. But once the hard work of getting all 20 extras to the pickup point was complete, it was pure pleasure. The Radisson is one of Nepal's best 5 star hotels and while the extras took turns being transformed into very convincing soldiers, we were treated to a 5 star buffet lunch. Man, was that delicious. The other great thing was that we got to meet the actors and film crew of a major TV production...and they were simply delightful. Really though, the best part was how the extras embraced the day. It never ceases to amaze me how Nepal attracts such adventurous people, UN workers, film makers, teachers, doctors doing internships, African soccer players!! !...and they were just the extras I got to talk to in some depth. To top it off, it was the best pay of any job I have ever had, which is a crazy thing to say from such a poor country. Crazier still, as I have no previous experience in this kind of work. I gave it everything as my finances were in a pitiful state and this has paid for my plane ticket back home in June...as well as my visa and months rent. An absolute godsend. Thanks Location Nepal and all the extras. I really needed a day like today. I was sick yesterday with a tummy bug. Fortunately I am able to shake these things off very quickly. It was in part due to overwork, as I had just finished two weeks in the kitchen working closely with the staff and looking at what works and what doesn't. I just LOVE systems and we now have plenty. It is just a matter of people following them?!?!?. We changed the layout and that has made the kitchen much more workable. We also have enough staff...the biggest challenge here in Nepal, as so many Nepalis leave the country looking for better pay. Partly, I blame the tourists who are always driving down prices. The profit margins are so low as it is. It is a miracle to me that Nepalis can stay in business. Nevertheless the rewards can be great. The staff are calling me Ama, (mother) which is a real honour. Restaurant work can be grueling so I really appreciate their hard work, I want this to be a rewarding place for them to work in. Since being in Nepal... almost a month now, we have been experimenting with our urban garden. It is magical to see our micro greens bursting out of their little stainless steel trays, which are normally used for curries. Micro greens are nutritious, delicious, very cheap and fast to grow. Being exquisitely beautiful is a big bonus. Nepal has such great range of seeds and beans. The growing medium is coconut coir (from Bunnings...and available here, I have since discovered). Coir holds moisture really well and is friable, so it is the perfect for seedlings. Anyone with children, this is a really fun and educational experiment... especially for city kids. Cress and Silam (a Nepali pickle seed) are my favourites. The possiblitlies are endless. Next we will try mustard and rocket. The sad news is that a few days ago our beautiful aquarium sprung a leak and within a few hours, it developed a crack which led to the entire 600 litres and all our fish escaping onto the floor. It was as much a shock to the fish as it was to us, but we managed to rescue 78 out of the 100 fish. The aquarium isn't repairable and now we are faced with the problem of dismantling it and replacing it. Anyone with experience in glass cutting please contact us. It is a real tragedy as the plants were doing so well and now they are in shock as we adapt them to a hydroponic system...the fish have now gone on vacation to the aquarium shop. Fortunately, I bought a Bokashi composter in Australia, which I discovered in Bunnings...along with 40kg of interesting and useful 'stuff.' Bokashi is an anaerobic Japanese composting system which is ideal for city households. It produces liquid compost so we are at least able to feed the plants with organic food. Another steep and somewhat painful learning curve. We had a wonderful time at the restaurant last night with Landmark Forum leader Gurmeet and his family. There is nothing more inspiring to me than being around a large, warm, extended family of three generations who have all participated in the LF..... and who are on vacation together. Thanks Uttam for the 'surprise' visit. It was a real pleasure being with your family and the SOCH boys. Gurmeet saying that the restaurant was impeccable was the greatest acknowledgement. I am so looking forward to a Landmark course in Nepal next year. Yay! We've just published in a blog called ‘The Altuistic Traveler’ by Bianca Caruana. The topic is ethical eateries in Kathmandu. Great to be acknowledged. Looking back at what inspired me to jump on this roller coaster. David Brownfilmed this footage in Lamjung in January 2012. After we returned to Kathmandu, the guys showed me the restaurant....2 days before we were due to return to Australia. It was such an exciting time and it was a very quick decision....the best I have ever made. Sometimes it is better not to know about the possible obstacles otherwise we would say "no" to the best opportunities. I'll be going back to Nepal on the 6th March. We are steadily gaining ground and I am looking forward to the next chapter. Our good friend Matt Pettit recently brought some travel bloggers to the restaurant. This shoulder season March to May will be interesting...the first time we will have an established presence in this very competitive market. While I am in Australia enjoying time with my family, I am also registering Sarangi as a charity. I am able to do most of the work myself, however I need a lawyer specialising in this field to give me advice and feedback. We have come such a long way and I promise that this is a very exciting, interesting and rewarding stage. We are applying for DGR (Deductible Gift Recipient) status and as Australian charities receive tax concessions, there are huge benefits if we are successful...and...selling our chef wear will be made a whole lot easier. While the name 'charity' sounds like we will be depending on donations, the reality is that we are committed to the Social Business model. Australian charities are permitted to make a profit as long as the profits are used to further their charitable purpose... which for us is alleviating poverty, by creating employment opportunities in Nepal. Please share this post or contact me personally if you know someone who would see this as an opportunity. It is very difficult not to get caught up in the extreme highs and lows that seem to come with the territory of creating something worthwhile in Nepal. Both become a huge distraction and make simply getting on with the job a big challenge. For example...the minute we reached #1 on TripAdviser, a really big high, two Nepalis walk in the door and write our first bad reviews. 2:"Terribles" in fact ... after 85 "Excellent" and 7 "Very Goods". While the sensible thing to do is learn from this, and quickly move on...and which I am able to do eventually, my immediate reaction is go into lioness mode and defend my cubs. I did successfully report one of the reviews as unfair but the other one has stuck...and now we are back to #11. Of course we will pick ourselves up, but it is very discouraging for the team in Nepal. Please send your support to Kedar Gandhari. It is not an easy job that he is doing. Today we reached #1 on TripAdviser. The first time we got to #1 was a technical glitch, I am sure... as going from #21 to #1 and then back to #21 two days later didn't really make any sense. This time however, we have been steadily climbing over two months. It is a bit scary.... but I think we can deal with that!!!! The best thing about this is that the restaurant is being completely run by Kedar Gandhari ...as I am in Australia. I get messages from Nerika Guragai our girl chef...who makes the best croquettes, that they are all very proud. I have watched Sabin Kanxo who has been with us from the beginning (apart from the post earthquake days when we closed the kitchen) go from strength to strength. It is remarkable how a village boy has transformed himself into such a good chef. I really miss your Dahl Bhat Sabin Kanxo. This is one of the reviews that explains why we have come so far". "Possibly the best night I've had in Nepal so far. Words can't describe the feeling of culture and genuine feel of this place. It is truly an experience. We ended up getting there about 7:30 last night and didn't want to leave. We were provided with blankets, cushions. Great food. A group played live drums (mardel), guitars (sarangi) all night. It was so entertaining just to sit there, eat and watch. The restaurant was alive with dancing and all. Highly recommend it. We're considering going back there tonight. Prices are cheap as well, we spent $60 Australian between 3 people and we ate way too much. We also purchased a cd to help the children in need - don't forget to do that (included in the $60). Great place for a feel of true genuine Nepalese people." After many months, our Urban Adventure "Tailor made in Kathmandu" is live on Intrepid's website. It has been a very long and sometimes frustrating process but we are ecstatic. Intrepid is the biggest travel and adventure company in the world and they have a very strong commitment to community development. Their head office is in Melbourne and their Kathmandu office is in eyeshot of the restaurant .... an incredible bit of luck. "Tailor made in Kathmandu" is a day tour where we take guests to Indra Chowk, the local fabric market and then back to Sarangi for lunch. The guests then design their own clothes with the help of our tailor who delivers the finished garments a few days later. It is a great opportunity for guests to meet the Gandharba musicians, taste our delicious food and learn about our social business projects. It is also a great link-in to our chef clothing business. It puts us in a much stronger position as far as partnerships go. Very, very exciting stuff. I am very proud to say that we are now #2 on TripAdvisor. Having such a strong online presence ...with both Intrepid and TripAdvisor is a dream come true. Even though the tourist season is officially over, there are always tourists around. The difference is that we are now claiming some very healthy market share. ...big sigh of relief!!! and a Happy Year New! It is starting very well. Today we reached #4 on TripAdvisor and are statistically the best performing restaurant in Kathmandu for the quarter... in terms of averaging 4.95 stars. It is such a satisfying feeling and confirmation to me that the Social Business model works. After spending a lot of time feeling disappointed and cynical in the early days, I am sure now, that people WANT to be inspired. It is exactly how I envisioned it would turn out.... back in 2014. It just took a lot longer. The big lesson for me this time round is that I can't expect my ideas alone to get me where I want to go. I really needed to roll up my sleeves and do the hard yards...and it took 9 months. Throwing one's hat over the wall and doing what it takes to turn ideas into reality is what is required. It is only then that you can really inspire people to jump on board. I feel that only now, are we really beginning the project and I have complete faith that Kedar Gandhari will be up to the job of taking up the reigns over the next couple of months. It has been a steep learning curve for him as well, but he is an excellent student and working partner. The final version of our chef clothing catalogue is off to the printer today...ready for the next big stage. Two more sleeps before I go back to Australia and I am feeling very excited and happy. We are very excited to have completed our first sample range of chef clothing and I am in the process of designing our catalogue. Nerika and Shankar our chefs were wonderful models as well as Shankar Pantha our waiter. Handsome Gandharbas, Santosh GB, Amrit Gandhari and Buddhiman Gandharba did a great job at pretending to be chefs. Thanks also to Niall Caomhanach for his brilliant photography. It was such a fun and productive day. And of course the biggest thanks goes to our wonderfully talented tailor Suresh. I feel very proud to have got this far. Making the brochure is one of the really fun jobs I have. I will bring it back to Australia with me on the 22nd Dec as we intend to create chefwear for the international market. This is the front cover and a couple of images that we will be including. Also....a message for our Nepali friends. We are looking for a sales rep, the initial target market being hotels and restaurants in Nepal. This is a very special opportunity for a talented sales person. Our wonderful vegetarian and vegan food is now available through FOODMANDU. a home delivery service. We have gone from #85 to #7 on Tripadvisor in only a few short months. Check out the reviews. 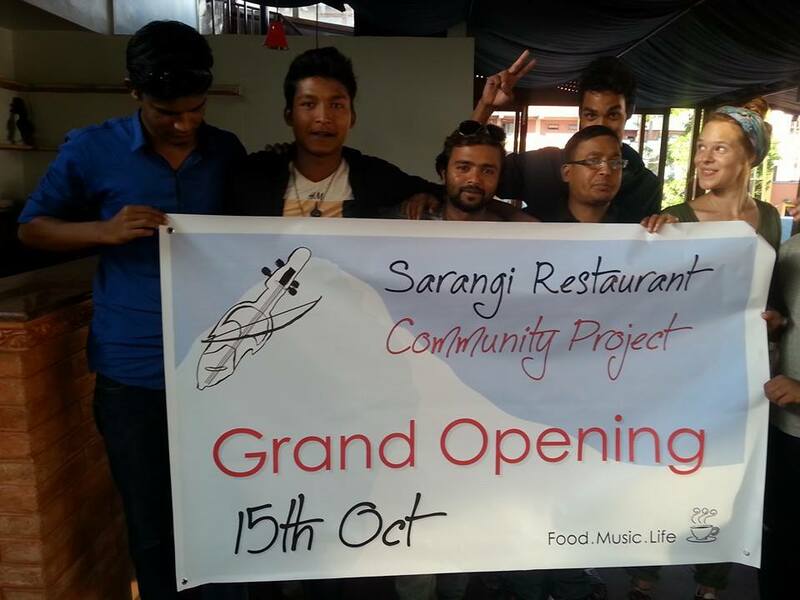 It is no surprise..... as SARANGI is an inspiring community restaurant based in Thamel next to the Kathmandu Guesthouse. Please support us by ordering through FOODMANDU. We promise you won't regret it. After a couple of heady days last month, having gone from #21 to #1 on Tripadvisor in one day, we settled back to #21. Slowly we are creeping up. Today we are at #11. The goal is still to be in the top 10 by Christmas. Very achievable. A big thanks to all our wonderful guests and project partners. We are now making nut milks...cashew and almond, soy milk and coconut milk. One trick we use when making coconut milk from whole coconuts is to pass the pieces through a juice extractor first. This produces a rich coconut butter. We then add water to the pulp and blend before straining it to make a rich milk. It is actually cheaper than the tinned stuff and infinitely better tasting. It can be frozen and we are drying the pulp, then toasting it to be used as garnish. Congratulations Nepali government. We now have 24-hour electricity in Kathmandu. Such a wonderful luxury. The air quality is noticeably clearer as a result ...without the generators. Fewer hacking coughs and spit all over the pavements. Of course this makes running the restaurant much, much simpler. A chilly but beautiful morning in Kathmandu. This morning's yoga session with our teacher Larissa Matteyssen on the terrace of Sarangi Restaurant....and then a delicious breakfast. I gobbled up the tofu scramble before I got to take a photo...recipe compliments of one of our lovely guests. It was so, so good. I am truly amazed by how tasty vegan food can be. For tourists and locals yoga is free when you order breakfast. Please tell your friends. In Nepal even the poorest people will do anything they can to send their children to private schools. The quality of education in the public system is very, very poor. It is not uncommon for families to spend more than half their salaries on their children's education. This video is very inspiring to me and worth watching. Of all the 'aid' projects I have encountered in Nepal, this ranks as one of the highest....especially as it is a Nepali run program. Well done Teach For Nepal. #1 out of 553 restaurants in Kathmandu. This is impossible. It can only be a miracle or act of God as we are operating on a skeleton staff. All the kitchen staff are at their villages and I am the 'head chef' with the help of Rajan a volunteer. Thank God for Kedar Gandhari Amrit Gandhari and Subash Flutistwho filled in tonight as waiters. It has been our busiest day ever. A true miracle. Now at #22 on TripAdvisor ....that's 7 places in 2 days!! We have gone from #85 to #29 out of 547 restaurants in Kathmandu in just three months...and accelerating since starting our aquaponic garden. It has taken constant generating and great teamwork. Kedar Gandhari is a rock. I acknowledge you for your commitment and long hours of hard work. I also acknowledge Ramesh Dahal and Sabin Kanxo who cook our beautiful food. My personal goal is top 10 by Christmas. Being off the street and up two flights of stairs..past two other restaurants has been a huge challenge. It is a classic case that our worst feature is also our best feature....as it is very peaceful and open...once you get there. We have a south facing aspect, so we get flooded with light and warmth in the Autumn, the high season and this is very rare for Thamel. We have along way to go before we are making good profit, but we are definitely heading in the right direction. If our Facebook friends who have not yet posted a review on TripAdvisor...and enjoyed the space could do so, we would very much appreciate it. It is truly the most powerful thing you can do to support us. Please also like our Facebook page. That helps as well. Our new flyer...off to the printers today...and then it is marketing like mad to make the most of the season. Please share with your friends. Thank you Niall Caomhanach for the food and sarangi photos, Anish Shakyafor the aquaponic photos, Alyssa Enright and Dillip for the artwork and of course Ramesh Dahal for the beautiful food. A wonderful day celebrating my birthday with my Nepali friends. Today we are shooting our 'Tailor Made in Kathmandu' Urban Adventure. We will be taking tourists to the local market to buy fabric and then be coming back to the restaurant for lunch. This will be followed by an opportunity for the guests to design their own clothing and then be measured by our tailor, Suresh, who is making our chef clothing. This will bring in extra income for the restaurant as well as creating employment for some of our friends. And of course will be a lot of fun for the tourists. Thanks Roslyn Scott Sophie Florence and Fee Fee Firoozeh Kamyar for being so generous and good natured.... and to Anil Gandharba for his superb music in the background. Also a huge thanks to Anish Shakya for so generously filming this...for a pittance. I am sure that this will be a very popular Urban Adventure. We were very lucky last week to be offered a job finding extras for a UK based film production company making a comedy travel and adventure series called 'Foreign Bodies', which will be aired on Channel 4. This is actually good money and a very good way to get travellers to know about the restaurant. So far at very short notice we have had to find 29 tourists for 4 different locations including an airport scene, a cafe scene in historic Bhaktapur, a monastery scene (with 2 nights accommodation included) and a Thamel street scene. It pays the tourists US$70 and us US$15 per person. This is very handy money for us but has been a huge challenge with only very limited time and lots of trugging around late at night in unseasonably heavy downpours of rain.... and hanging out in smoky youth hostels. PS This post is meant to tempt people to come to Nepal...or go anywhere else in the world..to a place you have dreamed of going to for an adventure. Thank you everyone for making last night a great night...especially Sanu Maharjan, Ijan Man Piya, Amir Bajracharya for their many, many hours creating our aquaponic garden. Thanks also to professors Dr. Kedar Rijal, Dr. Udhab Raj Khadka and Dr. Bishnu Chapagain from Tribhuban University for offering courses that will make a big difference to Nepal. We are hoping that this will inspire others to consider urban food production systems. And of course many thanks to the Australian Ambassador Glenn White and his lovely wife Maryanne for sharing in our celebration. We could not have done this without our chefs, Ramesh Dahal and Sabin. Thank you for your talent and commitment to making the restaurant a success. Sagar Paudell and Tulasi Adhikari for their kindness and taking so many photos. Anil Gandharba for sharing your commitment to the Gandharba community. Candace Kolb for your warm support. Laxman Gautam from Nepal Tourism board. Your good humour and warmth are an inspiration. Alex Stephen John for many hours of selfless contribution...and for always bringing a smile to even the most trying of circumstances. Maud Van de Worp for your lightness of heart. Please say thanks to your friend for being a wonderful waitress. Arya Shree for generously lending us extra plates and glasses. You are always there for me and I appreciate your friendship. Alyssa Enrightt and Dillip for your wonderful artwork which has brought the terrace to life. Many thanks the Gandharba team, Kedar Gandhari, Pujan Gandharba, and Amrit Gandhari the backbone of Sarangi. and most importantly Anita Kerr Nepali for your patience around the glitches in viewing the Seven Women documentary 'Bringing the Light'. We will do this again and be much better organised. It certainly wasn't all smooth sailing but considering the challenges, I think we all did very well. Today I rest!!! I can't wait to see this side lit up at night. With the veges added in the foreground it will be spectacular. We will be offering yoga with breakfast in a week or so. Imagine doing yoga surrounded by organic veggies and then eating them for breakfast. The only thing I am worried about is becoming too attached to them being alive!!! The first panel going up. On virtually every stupa, which is a shrine of Buddhism, in Nepal, there are giant pairs of eyes staring out from the four sides of the main tower. These are Buddha Eyes (also known as Wisdom Eyes), and they look out in the four directions to symbolize the omniscience (all-seeing) of a Buddha. Between the Buddha's eyes where the nose would be is a curly symbol that looks like question mark. This is the Nepali character for the number 1, which symbolizes unity of all the things. The aboriginal inspired artwork symbolizes a meeting place....which we are creating in the restaurant. The scale is very impressive. Allysa and Dillip are creating a massive artwork /sculpture which will surround our water tanks on all four sides. These hideous tanks have blocked our best view from the terrace for so long now and are visible from Kathmandu Guesthouse...our target customers... so it is very exciting see the work develop each day. It is turning out so much better than I expected. Allysa and Dillip are an Australian / Nepali couple and will be getting married soon. The perfect creative team for the project. I have always fantasized about having a personal chef....and now I have one....just like I used to fantasize about have a huge work table back in the days before Kids Art Works. Ramesh Dahal is a 5 star chef who worked at Hyatt and Dwarika's in Kathmandu, and more recently as a chef de partie at the Hilton in Dubai. The bread is homemade and the lettuce from our rooftop garden. Just goes to show how hard work and commitment can turn fantasies into reality.....and he is a really nice guy as well! At the International student office Bishwa Bhasha Campus applying for a study visa. No one to serve us so we had lunch in the cafeteria. This is a very big world away from a university campus in Australia. The irony is that lunch was under $1 and that included a bottle of water....and it was delicious. My appreciation of Nepali food has finally developed...only took 9 visits. I can't believe how much I love it now. Fortunately the aquarium, that apparently weighs 500kg is now safely perched on it's stand. This was nerve wracking, as the guy who built it (on site) assembled it on a flat surface... and consequently there was no easy way to lift it. This was done last night after I had left, so I was very relieved to find it one piece this morning. The pipes have been painted and look great. They will be secured to the railing today ready for the plants to be inserted. We can also start testing the ph of the water. Getting the water ready for the fish who are arriving from Singapore is a big job. We may need to borrow 100 fully acclimatized fish from the aquarium guy for our special celebration event on the 9th September. Apparently there are over 2,000 aquarium enthusiasts in Nepal, so I think we will get a lot interested Nepali's coming to the restaurant. Our guest of honor at the event will be the Australian ambassador and his wife. Other guests include lecturers and professors from the Tribhuvan University and some of the big environmental INGO's. Urbanization, as a worldwide trend means that a lot of people are interested in urban food production systems. We are also developing some very simple (and cheap) hydroponic systems suitable for schools. I feel happy that we are creating a model for Kathmandu. We are also very happy to be hosting the Nepal premier of Australian NGO, Seven Women's new documentary 'Bringing the Light'. A big but satisfying job. We are counting down the days until the 9th and ticking off a long 'to do' list. We are pulling out all the stops with a rooftop aquaponic / organic garden and cinema / yoga space. Today..... Alyssa, an Australian artist and Dillip, a talented Nepali, start creating some amazing artwork. Their first job is to create a sculpture around our really ugly water tanks. Our local friends can see them at work every day for the next few weeks. And.... we have Ramesh Dahal, a 5 star chef who worked at the Hilton in Dubai.... great food, great music and an even greater cause. These are the 'before' shots from KGH.... Keep tuned for the 'after' shots in about 3 weeks time. This is a dream... a long time in the making. Sanu and Amir, two very clever and generous Nepali university students are installing a hydroponic garden on our terrace. These PVC pipes will be attached to the railings and will contain gravel. The holes will be filled with our seedlings. Nutrient rich water will then circulate through the pipes. The advantage of this system is that it is low care, uses minimal amounts of water and avoids unhealthy micro-organisms found insoil. The added advantage for the restaurant is that we can provide fresh vegetables that are insecticide and herbicide free....and....will look beautiful from the street. Attracting customers into our courtyard has been an ongoing battle. The next stage (once we can afford it) is to attach an aquarium. The fish waste from this system 'aquaponics' feeds the plants while the gravel filters the water. I just love this kind of thing. It will take another week to complete as a lot of the bits need to be imported. I can't wait to post the finished result. Our brand new microwave/convection/grill...and freezer. So much more will be possible with this equipment. Thank you Martin for your faith in me personally and in the project. You are a rock. A few weeks ago, a masala grinding stone appeared in the alley near my hotel. Every time I walked by, I remembered spending time in a Gandharba village in Lamjung and waking to beautiful aroma of freshly ground masala being prepared for sweet buffalo milk tea. Absolutely delicious. Unfortunately this very simple but beautiful house was very badly damaged in the earthquake and will be demolished. This morning, I decided to rescue this abandoned stone. It is a particularly large version...around 50kg. It has a big chip on the lip but I think it is still really beautiful. I have picked up many treasures from the side of the road in Australia but never expected to do this in Nepal. We will use it in our Intrepid Urban Adventure cooking class at the restaurant...which will start in September when the tourist season begins. Happy election day Australia. I voted yesterday at the Australian Embassy in Kathmandu. Some may remember this lawn in the grounds. Last time I was here it was filled with tents....in the days after the earthquake. It was raining then as well. It was eerily quite this time and I was the only voter...half an hour before voting closed. I was blown away today by the number of people attending the 2 day International Social Business Conference at the Hyatt in Kathmandu ...500+. It was a real eye opener. Yay! for Social Business worldwide. Our first branded apron. Tomorrow is International Social Business Day and we are speaking at the Summit Hotel in front of some very big wigs about all our projects. Amazingly this embroidered logo was done completely by eye on a very simple sewing machine. Once we go into full production, they will be created by computer generated, sophisticated labeling machines...but for quick 2 hour turnaround and at $1 each this is a pretty good result. Very clever Nepalis. This Gandharba composed a song that went viral in Nepal. The traditional role of the Gandharba was to spread the news. This song is about the 13 Nepali who were recently killed in the terrorist attack in Afghanistan. He is sending a message to the Nepalese that if they do hard work in Nepal then there will be no need to risk their lives going abroad....so "Stay in Nepal, be creative at home". Back at the farmers market selling our muesli. Getting there is a bit of an adventure but I've learnt how to stay on ‘Nepali style’. Freshly baked bread from Sarangi ovens. Ramesh our new chef just came back from Dubai. Easily the best bread I have tasted in Nepal. Three days ago, I was having breakfast at my favourite local. I have met many interesting tourists at this shop but on this day, I was particularly blessed to meet an Australian couple and their delightful four year old daughter. When in Australia, David, Catherine and Maya live on a catamaran in Cairns and they are now cycling through Asia. Turns out they have worked for Australian Geographic and by the end of the conversation, they volunteered to film our two minute video for our Urban Adventures tour with Intrepid. Sometimes I need to work really hard in order to move things forward and then suddenly I am offered exactly what I need... on a platter with very little effort. The universe conspiring to test my conviction and then reassuring me that it is all OK. The restaurant renovation, whilst mostly enjoyable, was grueling. And then David, Catherine and Maya appear....a godsend. After 2 days of filming…blessed is all that I can say. We can’t wait to see the finished result in about 2 weeks. Our terrace is complete. We have a good sound system and our cinema projector is mounted to the ceiling...thanks to Frank. It is a very serene space and now that we have lowered part of the floor it can be used for yoga....tall Nepal are few and far between. Netra helped recreate the restaurant. It was a steep learning curve. He learned to paint and use a circular saw. A big job with bigger results. My mother's sewing machine came in handy. This time we used materials that won't fade, get dusty and are easy to wash.....live and learn. I am proudest of the ceiling. It cost about $190 for the whole place upstairs and down...plus miles and miles of sewing. The kitchen is spotless. Pure elbow grease and a bit of paint. My heart is in this place and we are ready to design the Urban Adventures with Intrepid and create a 2 minute clip for their website....the fun bit. This is for my old Centrepoint friends. We chose this carpet for its serviceability...being a restaurant. While it was being laid it reminded me of the red group room and Sue Holmes telling us a very funny account of her horror at seeing Paul Shefields choice...and him bragging that it was an exceptionally high quality carpet with a 25 year guarantee...an interminably long time to endure the choice. It was made even funnier for me as I got the measurement wrong forcing the carpet layer to add another piece....which reminded me of one of Paul's favourite expression "measure twice, cut once". Fond memories of you Paul ...wherever you are now. Yesterday was the Nepali anniversary of the 2015 earthquake. I spent some time being confused by this, as last year on the day of the earthquake, I was sharing breakfast with a surprisingly large number of Aussies at the Australian embassy (never guessing that I would end up in a makeshift refugee camp on the same lawn a couple of days later). We were commemorating ANZAC Day (25th April) with the Gurkhas who are renowned for their bravery and fought alongside the ANZACS. Eventually I got it...Nepalis follow a Bikram Sambat system which is lunar calendar. For them, this is 2073. It has been a very tough year for Nepal, and for us at the restaurant as well... but now that the tourists are slowly returning to Thamel, there is a feeling of optimism in the air. Right now we are giving it the mother of all Spring cleans. After a year of being barely open, this is a big job. The neighbors are in the middle of a multi story construction and this has created a big dust problem. Apparently, the neighbors on the other side spent 4 months pressuring the owners to put up dust cloths. Eventually after a threat of legal action they finally complied. The site owners have also drilled a bore so deep that they have siphoned off all the water, creating big problems for surrounding business that depend on their bores for water. These things are maddening to me, but as we want to negotiate buying some of this water, we need to tread carefully regarding the dust issue. This is definitely not a first world problem. In spite of all this, I am feeling upbeat today and enjoying working with Mangal, Netra, Ramsey and Samur. After a nerve wracking crash course in painting, we are transforming the place. I just booked my flight back to Nepal....arriving late on the 8th April. I'm really looking forward to seeing all my friends there and the next big chapter. Now that the tourists are returning to Nepal we will be creating the Urban Adventures with Intrepid. Let's see how that goes!!! Always a big adventure...whatever happens. Please consider Nepal as your next big adventure. We have some ways of making this really great so please contact me if you are considering it. Today was a milestone day. Partnership with a major international NGO...my personal holy grail for many years now. Major NGO's usually only partner big organisations so this is a huge achievement. This will open previously closed doors. I notice that my prayers these days have changed from desperate pleas for help to deep expressions of gratitude. YAY! I have always liked jigsaw puzzles....the small thrill when you are sure that the piece fits ....and knowing that you are one step closer to completing the picture. I have an talent for this. A puzzlers instinct. The project is like a big jigsaw puzzle and this week an important piece fell into place. We have now been officially accepted by Intrepid's Urban Adventures arm and will be profiled on their website. This will mean groups coming to the restaurant for cooking / music / dance (tours / classes). This will bring work to many of our friends who are really struggling right now. Nepal is going through some very hard times since the constitution was finalised. General strikes and political unrest have led to petrol and food shortages. Supply lines from India are blocked. This is on top of the challenge of recovering from the earthquakes. And when people get desperate, the most vulnerable ie women and children suffer the most. In spite of all that, I believe that there is hope for the country. Companies like Intrepid have a big and growing commitment to social responsibility. We are honoured to be selected for their Urban Adventures. This opens a big door for us and the next piece in the puzzle to put into place. While I am in Australia, our Danish friends Natascha and her dad Frank are running the restaurant. Frank who has lives in Nepal for 8 years is a genius inventor and engineer who creates earthquake proof construction materials and food processing factories suitable for the Nepali setting. We are working together with Trevor Moyle from SmileHigh to grow these businesses. Nepal desperately needs employment generating industry and these ethical business are ideal for Nepal right now. Natascha is assisting with the chef clothing business...quite a big job and to keep the boat afloat at the restaurant (until the tourists return) she is making bean bags for Hyatt and local schools. Frank uses recycled polystyrene in his building blocks which just happen to be an ideal filler for the bean bags. It is impossible to buy new beads in Nepal. I'm very proud of the job they have done. Bean bags are very expensive in Nepal so this is a good little business...and good for the environment. We're on our way. Upgraded from a bumpy public bus to classy 4WD compliments of a very generous Nepali hotelier who lives in Ghorka. We have a Polish student doctor and a accupuncturist and a NZ builder Keiran. Very good start. I may be off the radar for a few days. We are going to some earthquake effected villages to deliver aid. A big thanks to Craig McCracken and everyone who helped Kedar Gandhari to fund raise in Norway. It is rainy season now so it will be interesting to see how far we get. Since being back in Nepal I am so excited by the shifting attitude. The country is buzzing with innovation and a willingness to do things differently. Our job is to connect people through the restaurant (which has mainly been closed due to lack of tourists). Last night we had a dinner....more a think tank. We are looking for highly skilled volunteers. Engineers and craftsman to assist in some very exciting rebuilding projects. Please pass on if you know anyone. One of the things I love about Nepal......when your dentist charges you a fraction of what it would cost in Australia, then personally takes you to the Xray place on the back of his motor bike...... and then pays for lunch. Mingma Sherpa is a dentist from SmileHigh, a NZ/Aust/Nepali NGO that goes to remote areas to give free dental care to children. They are very generously offering to go to our Gandharba communities. This will be a 5 year commitment, so it is a big deal and we are very grateful. SmileHigh has done a great job with their earthquake appeal and Trevor Moyleis coming over soon from Australia to work with Mingma bringing much needed aid for reconstruction work to those that really need it. Anyone needing dental work can easily pay for their airfare and accommodation with a couple of trips to Mingma and know that they are supporting a really worthy cause. The best time to come is October, when the rains have stopped, the weather is perfect and the mountains are at their breathtaking best. Most people don't realise that more than half the country was not effected by the earthquakes. The low number of tourists makes it a perfect time to come here. Alan Barker is organising unique groups that make a difference. I will share his Facebook page soon. I love Nepal. It has been like coming home. It always takes me twice as long as it should to get from my hotel to the restaurant because I run into so many friends in the street. The biggest difference has been the missing Western faces. The shop keepers, hotel owners, trekking companies and restaurants are really struggling. The landlords are the only ones not suffering as everyone is still paying rent. We are looking at options for our restaurant. The government is supporting skills training so we will probably convert our restaurant into a workshop. Please consider coming to Nepal. This is truly a unique time to experience the best of the Nepalese people. Next week Kedar, Pujan and I go to the villages to distribute aid. I'm really looking forward to getting out of the city. Inside the gate on the leg to Kathmandu. As usual it is full of young men returning from virtual slave labour work in Malaysia. There are only 6 women on the flight, 3 of which are Western. I spoke with a very sweet Nepali guy who was returning after 4years. He said it was terrible. 15 hour days cutting up chicken. He has no family in Nepal...all dead. He has friends though. It's a tough life with so few employment opportunities in Nepal. I'm at Kuala Lumpur airport on my way back to Nepal. It was one of those deadly, sardinesque midnight to early morning flights… with a then glorious 5 hour transit stop in KL. This is the 5th flight of its kind for me in last 18 months and is by far the most exciting one. I am armed with a big variety of chef wear. 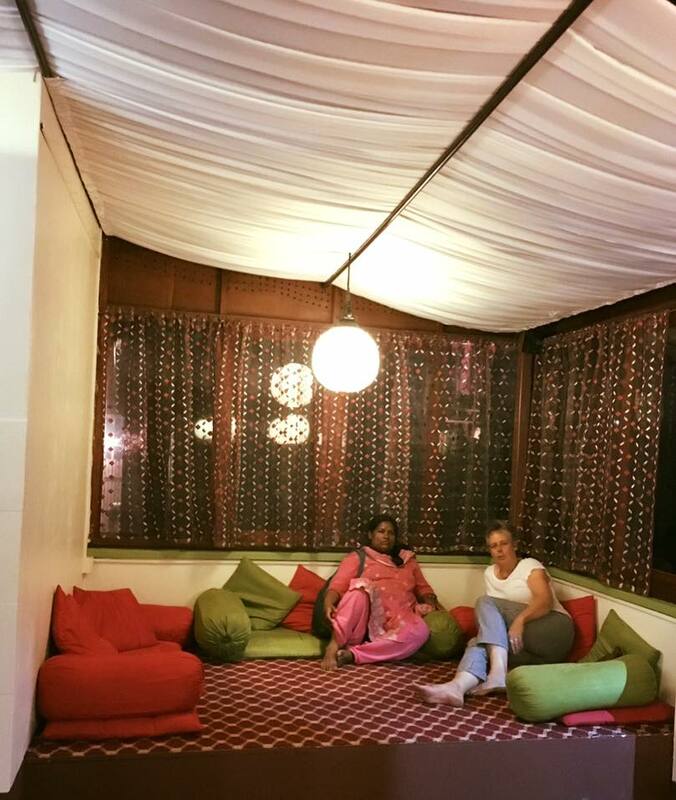 I am sure that Nasreen and her sewing women will be very inspired…and possibly daunted. I can’t wait to see their reactions. I will miss the comforts of Australia. My sister Caroline has been looking after me so very well. I will miss seeing that my electric blanket has been miraculously turned on each night. I will also miss seeing my mother every day….even if we do drive each other crazy. It’s a 10 week trip this time around as my daughter Bridie is having her second baby at the end of September….. something to really look forward to. I’ll be hitting the ground running…. but am also determined to look after my health….and sanity. A scary blood pressure reading is having me look at this....the problem being that I feel perfectly fine and virtually never get sick - a dangerously arrogant position that has made me complacent. It’s a very challenging time for Nepal but that brings lots of opportunities so I am very, very excited. I'm beyond happy. Tonight, our good friend J phoned from Nepal to say they are reopening the restaurant. It will now be used as a base for coordinating volunteers. The menu will be very simple.... but we can reopen the kitchen. And......the very best thing about this, is that the initiative has come from J and the boys....not me!!! It is simply the best news in weeks. With so many very difficult challenges over the last year, to have a restaurant that just happens to be earthquake proof is a miracle. The aim of the exhibition is to receive consultation and suggestions from all interested organisations. Another good place to shop is The Migrant Women Workers Group (MWWG) headed by Sunila Shresha. She supports safe migration (National and International) of women through economic development. They make the most exquisite, super fine grade,100% bamboo knitted scarves in many plain colours. I can bring these back to Australia before Christmas. Please contact me if you are interested. Kedar Gandhari is going to Norway soon, so please.... our European friends consider putting in an order. Sarangi is partnering both these organisations in order to source ethically produced fabrics and create Fair Trade chefs clothing. While I am in Australia I will be working on the designs so if anyone has access to good quality chefs clothing or contacts in the industry please contact me. Nasreen is an extraordinary woman who runs a womens sewing collective. I highly recommend her organization as an ethical place to donate for the earthquake crisis. We are working together on a Fair Trade chefs clothing business. I am absolutely appalled that the newspapers and TV stations here in Australia have largely stopped covering the earthquake. I can see more clearly than ever that long term recovery needs to come from ethical, employment creating business. A personal story about Nepali politicians. A few weeks before the earthquake we were negotiating with the landlord about renovating the courtyard. He was justifying not having answered my numerous calls and texts by saying that he had been really busy. He had been working on running for government office. The conversation went Nepali and after a while Amrit translated. He had run twice before, unsuccessfully and was running a third time in order to recoup his losses. Amrit didn't even flinch...an indication to me of how acceptable this mindset is to Nepalis. I decided to give the landlord the benefit of the doubt and to get to know him better...admittedly to oil the wheels of the negotiation... I asked him. "If you were elected, what would you bring to Nepal and its people?". This seemed to me to be a reasonable question. Big mistake. He spluttered for a bit, not being able to answer the question until I realized my mistake and quickly moved onto something else. I was left wondering how many other Nepali career politicians are of this caliber. I know many very intelligent and committed Nepalis. Why aren't they running this country? Kedar “Gandharba community project supplied 50 bags of rice, oil, salt , first aid equipment and tent (tripal) to the Gandharba family in Bandipur Tanahun, Thatipokhari and Lig lig kot in Gorkha. The project also supported Dalit community (Pariyar and Bk) in Lig lig kot Gorkha where people were not supported till the date. Mr. Raju Pariyar and Sushila Pariyar provided the list of people who are in immediate need of food and other logistics in that region. All the people thanked us for this great relief aid. This whole experience has challenged my preconceptions. If you look closely at the photo you will see that the book has a picture of a Lama on the cover. It was called Meditation Dream Yoga. Another officer was reading a text book on sustainability and the rest were busy on their electronic devices the entire flight. They were a very friendly bunch and allowed us to take photos. I'm sure they got a real kick out of us being on the flight as it was likely to be a once in a lifetime (hopefully) experience and all the civilians were in awe of this plane. "Restaurants are still closed in Thamel. There are no looting people are cooperative and supportive on this time. I'll be back in a week. People are still in trouble small quake happens 2/3 time a day. Fear has not yet been gone away. Monkey came in our restaurant and ate muesli juice and other stuffs. I did not how monkeys came? " Looting monkeys where the last thing I was worried about. 5 star refugee!?!?! When I put my name on the list of Australians jumping on the Air Force cargo return flight to Bangkok, I had no idea that it would include an entourrage of TV crews and that we would end up in 4 star hotel with accommodation (2 nights) and meals (full buffet) service included.... plus airline representatives lining up to provide incredibly cheap flights back to Australia. This has come on top of staying at 5 star 'refugee' camps at the US embassy and then the Australian embassy. If you read any posts that this has been in any way a hardship then they are lying. It did get a bit damp at night and we were definitely not allowed inside the building, but really compared to what was happening outside, it was luxury accommodation. I know this may sound pessimistic but I really believe that donating money for the earthquake victims through the big organisations is not a good idea. I suspect that most of it will be lost through their bureaucracy and corrupt channels once it gets on the ground. The Nepali government can't even agree on a constitution after many, many years. It is a judgement I know, but they seem completely incompetent. My advice if anyone wants it, is to donate to very small volunteer organisations with a very short distribution chain run by very trustworthy people. It has been raining all night making the situation much more miserable and dangerous as it exacerbates the landslide risk and makes rescue really difficult. Very depressing. The good news is that the power being down is deliberate. The power stations are fine. They are just load shedding it for safety reasons. I have learnt a few things about building safety from our very helpful Defat assessor, Mark. Apparently the biggest risk going into buildings is electrocution....the walls are full of wires. Next rule is to never go into a suspect building alone and then to test all steps and railings before putting full weight on them. Mark, who does this job in developing countries doesn't have a lot of confidence in Nepali building assessment and repair standards. I am hoping that this is big kick in the but for the Nepali government, that they will pick up their game and create lots of jobs. That may be wishful thinking. The other good news is that the roads from India (food and petrol) are clear. The streets of Kathmandu are relatively empty. It seems like fewer shops are open than day2. This isn't surprising as most people here are not natives of Kathmandu and have very strong connections in their villages. Most of the guys connected to the restaurant have gone to their villages. I am in contact with Pujan and that is all. The planes and helicopters regularly going overhead have a very different ...and strong associations now. They mean either getting people out, or medical supplies and food are going to where they are needed. Another familiar sound - emergency vehicle sirens have significantly reduced over the last day. I think that is a good sign for Kathmandu. While it is very clear that the situation in the villages is dire ... exacerbated by roads being blocked by landslides, it is hard to judge the severity of the situation in Kathmandu. There are very different viewpoints. There is a very strong camp, which includes many Western expats - residents here for 5 to 25 years and who see Nepal as their home....they are adamant that this is a not a serious situation and that everything will be back to "normal" by next week... a kind of possibility if there are no shortages of electricity, fuel and food. And then there is the more pessimistic camp, including the Australian ambassador who almost aggressively insists that the situation is very serious and that we must leave unless we have medical skills...and in fact that it is selfish to stay. We have decided to close the restaurant temporarily. The streets of Thamel are dead. Just a couple of restaurants open. They must have big generators and big food supplies. The tourists will be gone within the week. I have decided to go back to Australia for a few months. I have no medical background which is what they need right now and I sense that I will be just another mouth to feed. If I come back, I can at least get a job and pay for the rent on the restaurant ..not that much. It is a real blessing that the building is undamaged. Landlords here expect tenants to pay for all repairs...and mostly there are no leases...way to much power in the landlords court. We can always use the restaurant for accommodation if there is an influx of refugees from the villages. I am working on a Fair Trade chefs clothing project. This I can do from Australia, perhaps more easily than from Nepal. The irony is that I met an amazing man at the US embassy camp on Tuesday who will help move this forward in a big way through his project of connecting US university students doing Masters degrees in social business with Nepali university students. I think that working on this will be the best way I can help ie create employment during the reconstruction. The Australian government is providing a flight to Bangkok on a Hercules. It will be a return flight after dropping off medical and food supplies. I think it is one of those big military planes that move soldiers around. Today I batten down the hatches, move all my things from the flat to the restaurant and get ready to leave. Please consider giving aid to the Nepalis especially if it reaches those in the remote villages. A few people have asked if they can support the Nepalis at this time. Today I met a doctor at the Australian Embassy who is part of a medical response team. They are a team of 7 volunteer doctors, mainly Australian. They have a Facebook page TrekMedic Nepal Response Team and just happen to be here in Nepal. Tomorrow they go to Langtang the epicentre. This area is close to my heart as David Brown Films and I filmed here. There is a Gandharba community here who have been hit hard. All the money donated to this group will go directly to the people who need it....NOW. I will get their bank account details if anyone want to make a contribution. I am writing this post on my notepad hoping that sooner or later there will be Internet access for me to post it. The planes are coming and going which is a very good sign. The next biggest concern is the road links to India where a lot of the food comes from. There is very little information getting through so there is no way to verify that. Today, I made my way to the Australian Embassy after spending a night at the US embassy country club which is closer to the restaurant. I was very fortunate to be accepted, as they closed it to non US citizens minutes later. I had decided to spend the next few nights outside of buildings as there have been continual tremors ever since the first big one. My flat isn't looking great. It is on the 4th floor with a wonderful view over the valley. The building looks fine on the outside but looked progressively worse as I climbed the internal staircase. By the time I reached my floor (4th) there were serious cracks and furniture upturned. It makes me wonder if this is the case with other buildings. While the newspapers probably show utter devastation, mostly the buildings appear fine ... on the outside. My concern is that the buildings will be patched up without any real assessment. I packed my bag a little too slowly in retrospect, as the second quake hit a couple of hours later. Being a foreigner here gives you a lot of privileges. Like getting into embassies where there is water, food, blankets, sleeping mats and even hot showers. We have had unseasonably cold nights and last night it rained so I am sure that a lot of people had a miserable night. Very few people are sleeping inside their houses. Today looked much more like business as usual on the streets. I don't think that the Nepalis can afford to take the time off as mostly they are living hand to mouth. Electricity is still down although there is phone access at the Australian Embassy. This place is like a piece of heaven and everyone here is very grateful. Thanks everyone for the concern. I'm not the one to be worrying about. Internet access is finally being restored, intermittently. Kedar and Sudesh are fine. I'm borrowing a phone for this post. Haven't heard from anyone else in the team, as communication is terrible. No power or phone service. Nepal has loads of generators so its strangely better than 1st world in some ways. Spent the night in an evacuation tent...with a bunch of very noisy Nepalis and made some new friends. Sad to hear this morning about all the lives lost. All the tourists are trying to get out. I feel safe enough. Just need to be choosy about which buildings to enter. The restaurant is undamaged but I think there will be a big drop in business. Pity. For my family and friends I'm OK after the earthquake a few hours ago. There is no electricity so probably won't get Internet for a while. I'm going to the Australian Embassy to get more information. Safest place I think. In the Himalayan Times this morning. 2,000 girls are aborted or killed at birth every day in India...an estimated 12 million girls over the last 3 decades. The article also says that a recent awareness program has improved the situation. There has been an increase in numbers of girls appearing in orphanages ie a shift "from being killed to being thrown out"
(1) Standard kitchen ware in 100% cotton. Inexpensive, cool and breathable - disadvantage being that it wrinkles and stains easily. (2) High quality poly-cotton - looks and feels beautiful and irons easily. Less suitable for the kitchen. For front of house executive chefs. (3) 100% bamboo - incredibly beautiful, easy to iron and breathes….. expensive. The second range will be a contemporary ie with interesting fabrics and styles. Project Runway here we come!!! The next step is to source perfect fabrics then work with a trained pattern maker here in Kathmandu creating beautiful samples. We have a very helpful regular customer who has just put us in touch with his friends at www.cinemapolitica.org in Canada. Instantly we have access hundreds of quality (legal to download) films. It has been a real struggle to compete in the restaurant market...not helped by the restaurant below us blocking our plans to renovate the courtyard. This has been very disappointing but possibly a blessing in disguise. Focusing on the cinema market (no competition at all in Thamel) may be the best direction we could possibly take. So far we have just been showing documentaries on Sunday nights. We just need to fine tune the sound system and add some more sound insulation. I have been asked for more detail about the volunteering at Sarangi. We are looking for volunteers willing to spend between 1 to 3 months working in our community restaurant located in Kathmandu Nepal. It would require someone to be at the restaurant (at least) in the evenings. I am here from 8am to 9pm (but expect to reduce these hours over the next 2 months). It may suit a couple who are prepared to do separate shifts - as we are open 8am to 10pm 7days. This person/s ideally would have good computer skills and some business experience. I had a lot of business experience but no specific restaurant experience. I haven't found this to be a big issue. This person would need to be able to monitor our accounts (we have a computerized billing and accounting program). Training would be provided - it is not difficult. I could still do most of the marketing from Australia eg flyers. I would be available through Skype for any concerns that arise. This person/s main role would be to engage powerfully with customers ie be welcoming, friendly, interested...and open to opportunities that may arise. I often eat with the customers. Many are from NGO's and volunteer groups. Some are private individuals doing small projects or wanting to do voluntary work in the villages. This person must be able to create these situations as opportunities eg if someone writing for a travel magazine comes in, they must be able to enrol them into action and then follow up on the opportunity. We are starting a fair trade chefs clothing business in the next couple of months. This will need to be monitored eg quality control and arranging export. We plan to target large Australian restaurant chains, chef schools, airlines etc. This will be an online Fair Trade business so ideally we will go International. This person/s also need to understand that the Nepali mindset is very different from that in the West. It helps to see this as a challenge and adventure rather than an insurmountable obstacle. On the up side, working with the musicians can be enormously rewarding and fun. It is not a paid position although food from the restaurants can be provided. There may also be the opportunity for accommodation... about 20 minute walk from the restaurant....comfortable by Nepali standards ie frig, inverter (24/7 power) and a washing machine. I am subletting a flat from another woman. This is for an indefinite period. The rent is US$110 per month. There are also many opportunities for regular profit making business in Nepal as there are so many things missing here, so this may be interesting for someone with an entrepreneurial spirit. 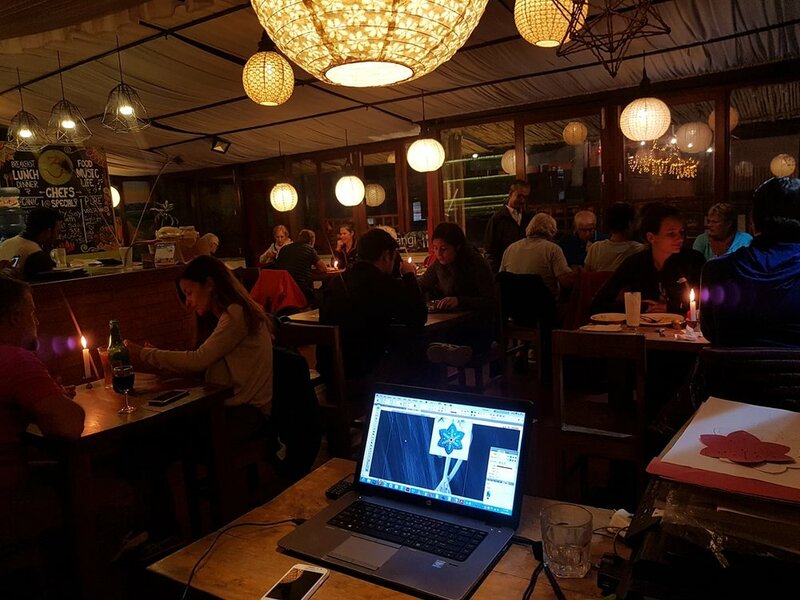 I view this restaurant project is a launching pad for future social business projects. It is for me is a training project. My intention is to create a Montessori equipment business her in Nepal as social business and start a major International NGO using the social business model. This is a 5 year plan. Thanks to everyone who came to the debut of our cinema on Sunday night. It was a very cold and wet night so we really appreciated the support. We got a chance to iron out the bugs....we definitely need a few extra speakers. Here is a shot of the space in the day time. It is impossible to take good shots at night. Thanks also to Belinda for helping with the curtains. 250mts of fabric.....miles of sewing, but we had a a lot of fun and they look great. The bean bags turned out very comfortable as well. This Sunday we have a special International Women's Day film night being presented by Bev a human rights activist. 'Sari Soldiers' and the doco David Brown and I made in 2012. I'm really enjoying this new phase. SARI SOLDIERS (92 min) was filmed over three years during the most historic and pivotal time in Nepal’s modern history, Sari Soldiers is an extraordinary story of six women’s courageous efforts to shape Nepal’s future in the midst of an escalating civil war against Maoist insurgents, and the King’s crackdown on civil liberties. When Devi, mother of a 15-year-old girl, witnesses her niece being tortured and murdered by the Royal Nepal Army, she speaks publicly about the atrocity. The army abducts her daughter in retaliation, and Devi embarks on a three-year struggle to uncover her daughter’s fate and see justice done. Making shortbread using traditional Nepali wooden blocks as stamps. I got the idea from Speculaas buscuits, Dutch spice biscuits which are stamped with windmill designs. Having Dutch parents, they were always my favourite biscuits. These Nepali blocks are usually used for printing fabric. I bought them because they remided me of Maori designs....another link to my past....as I lived in New Zealand for 15 years. Nasreen is an extraordinary woman who runs a Fair Trade Womens sewing collective nearby. Her contribution has been profiled in Forbes magazine. We are working together to create chefs clothing. I made this sample on my mother's sewing machine. It has been a long time since I have done any sewing so I am very pleased with the results. Our intention is to make a traditional range as well as a very cool, contemporary range.... and sell in the West. Chefs clothing is very expensive in the West and with a short supply chain we can provide quality clothing at very competitive prices... and create employment here for women. The profits will be used to create loans for women. This is very exciting. Yipee! 3.5kva of power!!! This is our new backup power supply. We are without mains power for 12 hours each day. Crazy situation for a capital city. I was a very difficult decision to make...AU$2,891 is a fortune here and it still may not be enough. We are also looking at a second hand 5kva generator AU$1,300 to get the water up to the roof. We are trying to enrol the other businesses in sharing this cost...not easy! A big thanks to Martin Campbell-Board for contributing $800 to this big cost. Our first complete bean chair.... on trial by Saba our chef. This has been a long time coming. The idea was to create a cinema space on our terrace. We made about 25 covers, assuming that the polystyrene beads would be easy to buy here. Big, big mistake. After trialing several different fillers we finally settled on chopped up life jacket off-cuts....lightweight and durable....and surprisingly comfortable. We are going to start with weekly documentary film nights and then move into nightly 'free movie with dinner' when the weather warms up. This is the small (Nepali) version. I got the pattern by cutting up a bean bag cover I bought at Kmart. Cool hey! I think these will also sell well at the Farmers market and the posh International schools. I am so, so excited. This morning Katie from the US bought one of Manoj's sarangis for US$220. Katie has played the cello for 5 years and Kedar has just given her her second lesson. This will make a really big difference to Manojs family and encourage more Gandharba to sell their sarangis through the restaurant. For Katie who is spending time here, it will be a wonderful way to connect with the Nepali she meets. Manoj is displaying some sarangi in the restaurant. We will offer these for sale to the tourists at a fixed price and with no commission. They range from $15 to $200 according to the size, wood used and craftsmanship. It is incredibly hard work selling these on the streets as the tourists don't understand the cultural significance of the instrument and the caste....or how desperately poor they are. Sometimes they are treated like beggars. Building a trusting relationship with the street sellers has not been easy, so this is a breakthrough. Lucky...almost putting full weight on his broken leg....after less than a week. He is looking like a million dollars now afte skeleton support medicine and good food...and a bath. Another exciting milestone for the restaurant. The boys are learning how to use our new computerised billing system. It is locally made accounting / billing / inventory software. We feel like a real restaurant. Today is the festival for education. Our waiters are students. They are studying Japanese and English. I am a student too. Finally... no gas to cook any food for the guests. Nevertheless, we can still have a great night.....just different. Lots of our guests want to learn to play the Sarangi. We have a group of 11 for breakfast tomorrow. It will require some creative shuffling of gas bottles. Amrit is bringing his bottle from his house. If there is Banda (general strike) I suppose he will have to come in very early. Ah! Nepal. Strangely I am getting used to it. Our latest Sarangi member. He has a fractured leg. Because he is so small, the vet recommend that we not get a cast. Just pain killers, worming and vaccinations. We are calling him Lucky, although Sudesh is insisting on calling him Jason..... after one of our regulars. I think Lucky is more appropriate. For a long time I have be watching the same 3 women trying to sell small bags to tourists outside the restaurant. This has been painful to watch as they are largely unsuccessful. So...as the weather is cold, today I bought 750gms of wool to knit hot water bottle covers. It only cost $6 so I think it is worth a shot. The colors are beautiful together and we had a lot of fun rolling the skeins into balls. The waiters want to learn how to knit now. In the worst case we will have some gorgeous gifts for our families. Back in Nepal end of day 2. All the usual frustrations...power plugs that don't stay in sockets and that need cellotaping to the wall to be usable and Internet that keeps dropping out…. and new frustrations, like a nationwide shortage of gas that may go for one more day…. or another 3 months. We have to decide whether to use our few bottles for making muesli (we now have a loyal following with 6 outlets and a 7th… if we have the gas to make it) or saving it for the walk-in customers – less now that the weather is cold. Of course we have the option of buying gas on the black market at 4 times the price. We also need to navigate the neighbors about signage at the entry to the complex. As with the road rules it is first in, first served and whoever is the pushiest gets the best and biggest spot. I am inclined to just get a sign made and to stick it up…and deal with the conflict later just like everyone else…. except that we have a very decent and diplomatic money changer who is encouraging me to negotiate in a civil manner. My experience of negotiating here is that the conversation is frustratingly illogical and circular…and goes on forever with the intention of wearing you down until you give up. In fact a very effective tactic. Back to Nepal tonight!!!! I'm so glad that the renovation is complete this time round and that we can focus simply on growing the business...catering / designing a range of trekking food / dried food and working on the Social Business Nepal loan for the villagers. A big thank you to Luke our business manager in Australia for donating a Samsung tablet and a mobile phone and also to my son-in-law Damien for donating a phone. My handbag looks like a Telstra shop. I bought a one way ticket and if everything goes to plan I won't be back for a long while!!! This morning I was moved to tears when I received an email from Kedar, our team leader in Nepal. I am so proud of what you are doing for your community Kedar. "We got a warm welcome in Dang district and met about 250 Gandharba from three different VDCs. They welcomed us by performing Dance and song. Children song and dance touched me. Amongst most of them, one small girl sang a song who has beautiful voice and sang a song about her life she sang about sorrows, challenges difficulties and the problem she is facing in her life. They welcomed by tika and garland too. It looked like a small Gandharba conference over there. It seems that they are in real trouble. 25% people from gandharba community come to Kathamndu every six months for working in brick factories with their families. About 10% do a labour work and 65% people still opting our ancestral job. They have a great hope when I talked about our project with them. There was silence for 30m when I had a speech about our project, objectives and our work. They would like to support our project and would want to participate. It would be good if we can get funding from SBN and launch our project there where people are looking for opportunity and have great enthusiasm to do some work." Thank you so much Geoff (a volunteer) who paid for the travel and food for 3 days to go to Dang district with Kedar, researching the needs of the Gandharba community. Geoff is a professional photographer for Red Bull and is applying his business skills to submitting the application. Here also are some beautiful photos he took in the village. Just beautiful. Happy New Year to all my friends and family. Last year was the most challenging year of my life by a long shot. Thank you.... your support and love gave me the courage to step into the unknown. Thanks especially to Caroline, Bridie and Mama for letting me stay these last few weeks. Thanks also to the Sarangi team in Nepal. It was much harder than I expected, so your love, acceptance....and forgiveness is really precious to me. Together we will achieve great things in 2015. Be home soon! What we are doing with the restaurant sometimes feels too hard. Things we completely take for granted in Australia like reliable power supply and water have me awake and worrying here in Nepal. Keeping the big picture as my focus is sometimes the only way to keep moving forward. Fortunately an Internet cafe in the complex has invested in a big generator and is sharing the power with all the other businesses and charging for usage. We researched the cost and we just couldn't afford it right now - over $2,000. One day we will get solar power. Some good news. Two groups came to the restaurant today, through conversations at the farmers market. Kersten, a very adventurous German woman and her Nepali friends Prakriti and Gopal are creating a social business. Gopal and Prakriti have been working tirelessly for years rescuing trafficked children and returning them to their parents ....and they want to partner us. They are organizing volunteers to come to Nepal and want to use our restaurant as a meeting place. This is exactly the kind of thing I was hoping for. Yay! All the hard work paying off. Now we are open we have guests. Most of them are coming via conversations at the Farmers Market and through the street people. Today we opened for breakfast for the first time. Just one guest but he came last night for dinner and returned because he was so inspired by the project and loved the food. Tom has been volunteering with the Peace Corp for 2 years. Tonight is his last in Nepal. I am really enjoying spending time with people making a difference....and there are so many here. It will take time as there is a lot of competition, but I know we will do well. The feedback we are getting is that the restaurant has a really great atmosphere. However, there are some big challenges. Today, after weeks of pushing every day, we finally have a good source of hot water in the kitchen. To solve the water supply issues, we have a roster to check the tanks on the roof. There is no mains water in Kathmandu. All the water is either brought in with tankers or taken from the ground (bore water). Our water is brought in by tanker. Electricity supply is another big issue...the average number of hours of grid electricity each day being 10 hours. In Summer this goes down to 5 hours. We realize now that we need an inverter. This is another cost and painful right now. We also need another frig. If anyone out there is willing to invest in the business, we would be really grateful. We are looking for loans not donations. We have a date for the opening....finally....and 3 flex signs. We will put these on 3 of our external walls. ...which are visible to heaps of popular hotels and restaurants in the center of town. It took an hour and cost $3 each (and apparently will last for years). Of course you are all welcome. I got really excited today. The coffee machine technician made me the perfect Latte with our grinder and coffee machine. Coming half way around the world was a costly and nerve wracking experience. They cost US$6,000 here new and are very difficult to pick up second hand. They are essential equipment. I bought it on eBay in Australia for AU$1,000 but the delivery and customs duty was about $1,700. I lost some sleep over this one....so that cup of coffee was the best coffee I have ever tasted. Also we have an angel in form of a German backpacker join us for a while. She is bringing all her German organisational skills and vast experience in the bar and kitchen....and is very good company as well. Where else would the coffee machine be delivered by bicycle rickshaw but here. I discovered the pause button on my camera but got a bit confused by the end so please forgive the wobbly end. Tonight our boys made the first full meal of 'dahl bat' in our wonderful kitchen. They are our waiters but they are surprisingly good cooks as well. It is for our musician guests. Most people in Nepal eat a very basic version of dahl bat - rice, lentils and potatoes twice a day, every day. Most foreigners find it incredibly monotonous. This particular meal is an upgraded version - with a chicken curry and pickle as well. The chicken was perfectly cooked. It has been a miracle what we have achieved. The menu is complete and I am loving working on the food side. My test is that the Nepali's love the food as well as the Foreigners. None of us have run a restaurant before. This is a social business, so the emphasis isn't only on making a profit (which we fully intend on doing) it is also about developing ourselves and everyone involved. For example Arun, the cook in the clip turns out to have a natural talent for cooking and I believe he will become a great chef one day. We have learned so much from this process. But.... as is typical here, we now have a huge festival Dassain on, where everything shuts down for a week. This is holding us up.... but I am making the most of it with a day or two off... enjoying the beautiful weather and peace and quiet. Finally our kitchen has started to arrive. All easy to clean, shiny, stainless steel. We are all very proud and happy with the design. Another day to celebrate the project. Almost there. Just a bit more decoration and the bar to stock.... plus sourcing some food items - much harder than you can possibly imagine. A very big job well done by everyone. Craig's recent investment is a God send. We are all very grateful. If you watch our clip you will see Sumitra (the girl dancing). She is a very bright village girl who enrolled in a 3 year nursing course yesterday through the help of our Australian friend, Emily Young, who is also raising funds for 2 autistic Gandharba boys. The process to get Sumitra enrolled was not easy. There is a lot of discrimination due to the Caste system and the fact that she has only a village education. She was competing with girls from the big schools in the city, so yesterday was a triumphant day for her… and the Gandharba community. Here are our first Gandharba waiters, Bijen, Bijay and Sudesh. They have started a month long course at waiter training school ($24 each). Sheila, our English friend and her Nepali daughter Grace are also very generously giving them free English language lessons on our rooftop terrace. These young men were about to leave Nepal for work in the Middle East. Going abroad for work is very tempting, as there are so few employment opportunities here. Unfortunately it is very risky, as they are mostly exploited. Many commit suicide. Our intention is to train our staff to a high level so that they can move on to jobs in the community and stay in Nepal, close to their families. Last night our tables and chairs arrived and even though we had worked closely with the carpenters at the design stage, I was really nervous that somehow they would be a disappointment. I was hugely relieved to see that they are beautiful. They are handcrafted from (mango) hardwood and are roughly sawn and oiled. I can see that they will age beautifully. They fit perfectly with the cushions that arrived yesterday… another unnecessary worry as the colours and textures work together beautifully. It was dark by the time we moved them all inside… and as our lights are yet to be installed, we decided to wait until morning to set it all up. Sitting amongst the jumble of tables and chairs and with only the lights of Thamel’s nightlife as illumination, the guys pulled out their instruments and started playing a beautiful Nepalese song. The joy of the music and the singing and dancing really moved me and I got a glimpse of the power of this project. We still have a long way to go but it is looking more and more like a real restaurant with every passing day. You should have seen Pujan. He was a fearless and tireless worker. The biggest cockroaches I have ever seen were pouring out of the walls and he didn't blink a eyelid. One more sleep. I'm off to Nepal tomorrow....for one year. I can't wait to see the renovation of the restaurant firsthand. The before and after will be mind blowing. Here is a glimpse of before and during renovation. The after shots will be even more astonishing. Our restaurant kitchen after tiling. Very exciting. Here David and I are in Nepal filming a doco about the musician caste. A culture at risk of extinction. Just as well we have met some amazing, committed and talented Nepalese who are doing something about this. Everywhere we go, opportunities present themselves. This is a small clip from a musician village. Yaaayyy! We now have a social business in the form of a restaurant in Gandharba Restaurant Kathmandu. Our restaurant was called 'Harry's Gastro' and by the look of the old kitchen it was named appropriately. Our new name 'Sarangi' is the sacred musical stringed instrument of Nepal. A bit of an improvement. There’s a lot of work to do and the rest of the team to create. We are very, very excited. Watch this space!